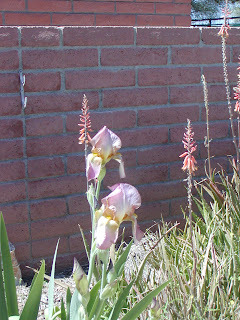 I have been hauling these irises around for a long time. My grandmother gave them to me from her garden and I have been digging up a batch and taking them along every time we moved. I have some in my garden, but the rabbits get at them a lot. The ones in the pool area are thriving. These are Badger Doe's kids. 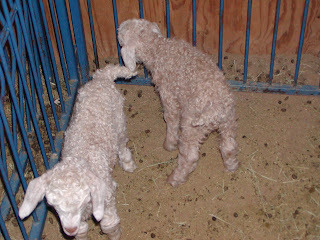 The whiter one is the first born and his mother's favorite. The darker one never got cleaned off. He has figured out that he can drink when the first born gets mom up. Kind of sad to see so much lavished on just one baby and seeing the other be ignored. 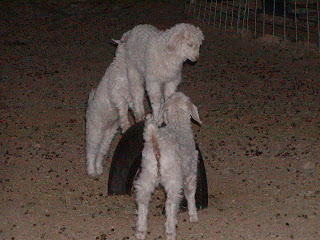 Three of the kids playing on one of th etires. Their idea of fun, while their mothers are eating. Kat's kids are not afraid of us, so Marc was getting a chance to handle one. I guess they still remember me and have not learned from their mother to be afraid yet.